Please have a look at Klim’s sizing chart below to choose a size. We measured a sampling of sizes in this jacket and found the chest and hip to match the chart pretty well. The waist sizes in the chart a bit smaller than the jacket measures, but in a 3/4 style like this, it is expected that you use the adjusters on the sides of the torso to adjust the fit in the waist area. We took some photos with the size Small jacket on our Fit Check mannequin Laverne so you can take a look at our photos see what that looks like. Laverne is a standard dress size 6/Small with a 35” chest, 26” waist and 36” hip. Klim’s Altitude jacket for women is a great choice for many types of riding. This jacket has a waterproof shell with Gore-Tex technology to make it waterproof. D3O armor is included. Yesterday I reviewed the Altitude pants and the Artemis pants together since I really didn’t find a substantial difference in the two styles. Both shared a pretty close feature list and “felt” about the same. Now that I look at the Altitude and Artemis jacket, I see the design difference in the two. The Altitude jacket is a bit lighter in weight with lighter materials. It appears a bit more stylish to me with a more tapered profile and leather accents on the sleeves and elsewhere. It also has less hardware showing. The Artemis jacket looks more rugged and “feels” more heavy duty. It also has more zippers and pockets on the front profile. To me it just looks more “serious” overall and it is more squarely aimed at the adventure rider. I really like the leather trim on this jacket. It is on the elbows and bicep area, but if you look closely, you’ll see leather welting along side the main zipper and also as a trim by the zippers on the back cargo/fanny pocket. Those styling touches dress things up a bit and make this jacket look more feminine to me. Don’t get me wrong, this is still a fully featured rugged jacket, but its just a bit more stylish in my opinion. 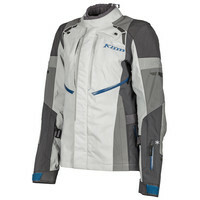 Like many of the other Klim products, this one has the bonded Gore-Tex shell. Its waterproof and breathable… even more so than other Gore-Tex products that are built with a abrasion resistant shell material and a separate liner. Klim’s design is a shell material where the Gore-Tex layer is bonded meaning fused into one material layer. It performs better and since the it is one fused layer of material, water will not penetrate through the outer layer like with separate layer design which means your shell material won’t be waterlogged in heavy rain. All the outer pockets and vents have waterproof zippers, so when they are closed, they are sealed. The zip vents are all “direct vent” meaning when the zips are open, air flows right through to your body (another advantage of the bonded Gore-Tex construction). This jacket has two large front vents just under the bust placed in the jacket on a slant, which looks nice. They’ll also be very effective. Sleeve end vents will flow air up the sleeves. The neck opening has little loops that will engage the molded plastic hooks you see on the front near your collarbone. Hook the loops to hold the collar tips back. This will get the collar out of your way when it is not raining and also gives you another point of air flow entry when its hot. This is a nice feature! Like most other touring jacket of the 3/4 length style like this, there are PLENTY of pockets. There are two hand warmer and two chest pockets in front and a LARGE rear fanny pocket. Like many other Klim jackets, there is a small left sleeve pocket for medical or other info and and another small pocket behind the back pad pocket to hide stuff if you want to squirrel away money or document in unfamiliar territory. This jacket, like most other Klim jackets, is fully fitted with D3O armor in the shoulders, elbows and back. The D3O is their standard. We’ve had a lot of experience with this armor and have nothing but good things to say about comfort etc. It is a product that is fully tested and rated to CE standards.